Are you looking for some fresh ideas and inspiration for your ministry heading into 2017? Need a ministry jump start? 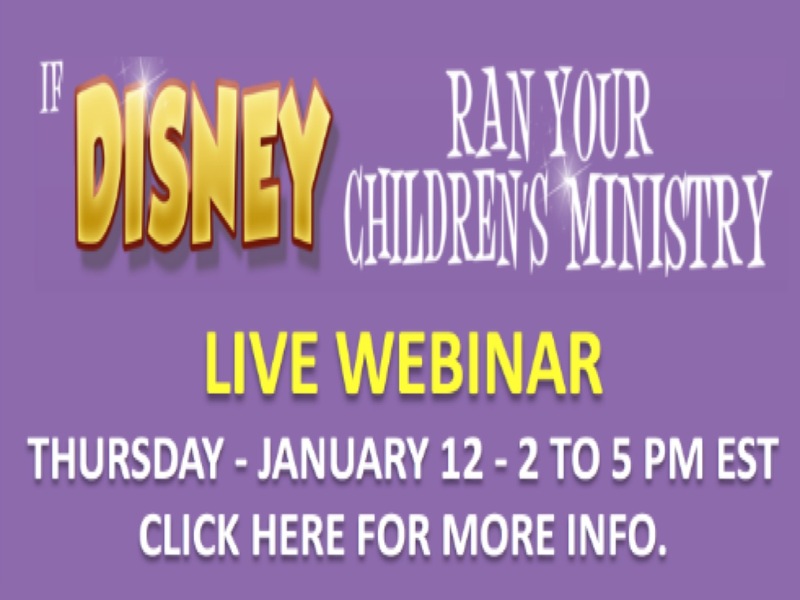 Then join us for the live webinar "If Disney Ran Your Children's Ministry." 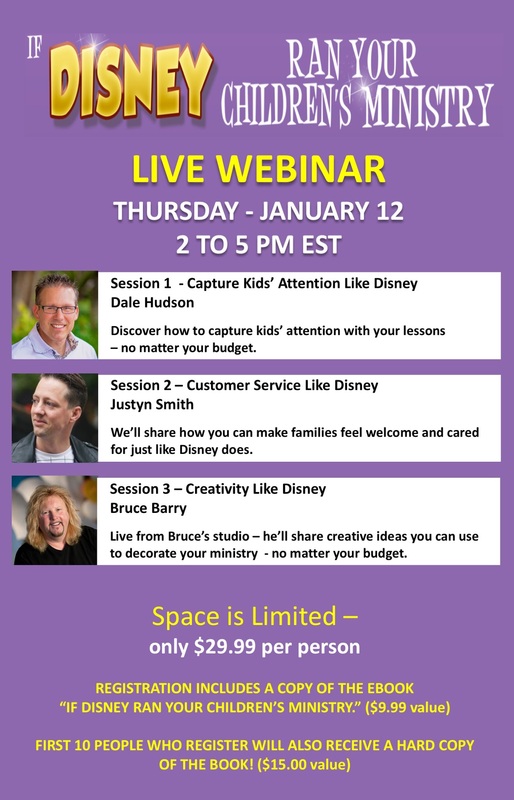 For years, Dale, Justyn and Bruce have studied the behind-the-scenes strategies that make Disney so successful at connecting with kids and families. And now they are ready to share those strategies with you! In session one, Dale will share how you can capture the attention of today's kids with your lessons so you can communicate the truth of God's Word with them. Dale has used these strategies to help build some of the largest and fastest growing ministries in the country. These are strategies that you can immediately put into action and see results...and the good news...they have nothing to do with budget size! In session two, Justyn will share how to give guest families a great first experience and see them return. Juystn leads a great ministry in Minneapolis where he has used these strategies to reach thousands of kids and parents. In session three, you'll have the opportunity to go into the studio of Bruce Barry. Bruce is a creative genius who has helped hundreds of churches create dynamic ministry environments. Bruce grew up immersed in Disney. His father worked as an artist with Walt Disney, the man himself. Bruce will share practical ways you can enhance your children's ministry environments with even the smallest budget. As a bonus, everyone who registers will receive a free ebook copy of the book "If Disney Ran Your Children's Ministry." The first printing has already sold out and is being read by hundreds of churches both nationally and internationally as well as being used as a seminary textbook. Space is limited. Don't miss this opportunity to invest in yourself and your ministry. You can register today at this link. Will this webinar be recorded for future playback? I would like to watch and learn from you but I'm not available Thursday. Hi Melissa. Yes it will be recorded and available for future viewing by attendees. Do I need to register before the event to view the recorded version or can I pay to view later? I will be unable to view it during the live session. Either way. Those who register for the live seminar will have access to it afterwards. It will also be available for purchase afterwards. I Pre-registered for the webinar, but I cannot figure out where to go or how to get into it. Any tips? Im getting a little frustrated that I may have wasted my money. How do I sign in to the webinar? Where do I go?